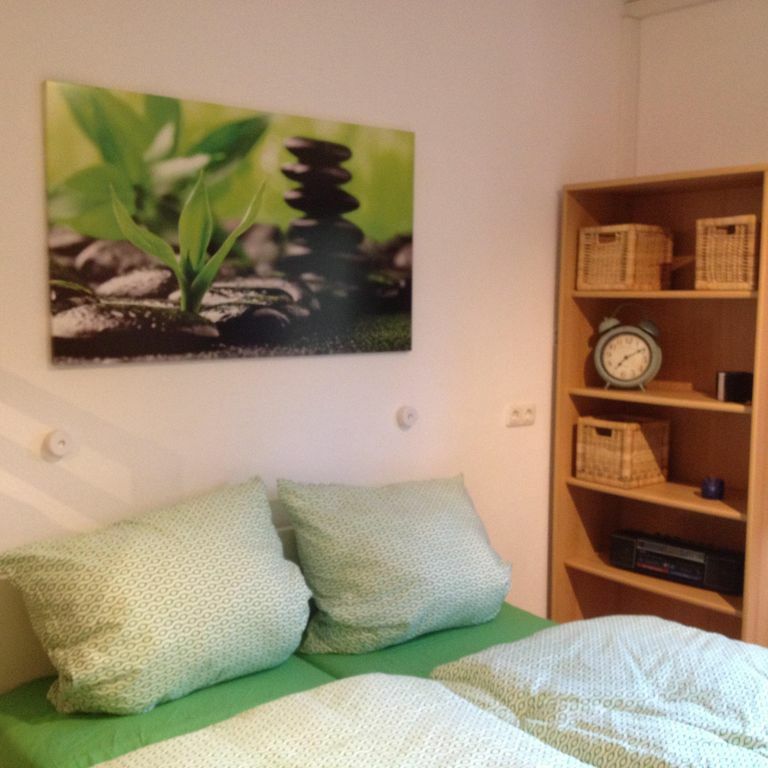 Beautiful, modern, 1.5-room apartment (36sqm) in Gasseldorf (district of Ebermannstadt) with separate entrance. The living-dining area is equipped with laminate, the hallway and the bathroom with toilet and shower are tiled. The living area has a double bed and a bunk bed for children (but also holds out adults :-)). A highchair, crayons, Lego bricks and puzzles are available. The apartment has free Wi-Fi and a TV. The apartment is located directly on the bike / hiking trail. It is 2.5 km to Ebermannstadt and 1000 m to the outdoor swimming pool. A nice playground is located in the immediate vicinity of the apartment and in the neighborhood there is a pony rental. The location is very quiet, because the apartment is located at the end of a dead end in the middle of nature. The highly recommended Greek restaurant "Laki" is located 200 meters away. It is possible to go from Gasseldorf by bus. From Ebermannstadt there is also a train connection to Forchheim (leaving every 60 minutes). Gasseldorf located right in the Franconian Switzerland: With its hiking and cycling trails, the inline options, the caves, the canoeing, climbing forest, swimming, climbing on rocks, riding and visiting castles and and and .... you have many ways to relax and enjoy nature. The surrounding areas of Bayreuth, Bamberg, Erlangen and Nuremberg invite to a city stroll. Hair dryer, shampoo, shower gel and towels are provided. Soap for the hands, toilet paper and Kleenex as well. Lovely place, good location for exploring the region, comfortable and great for our two toddlers. Everything was as we wanted: good facilities for self-catering, independence and privacy, toys for kids, Wifi, parking space, responsive but unintrusive owners nearby for any queries (e.g. even by WhatsApp for convenience). It is located im Gasseldorf near Ebermannstadt, so handy for supermarkets and lots of interesting places to explore in the region by car. Complementary drinks on arrival, inc. local beers was a winner for me! Wholeheartedly recommend, especially for families. Gemütliche kleine Wohnung mit Abendsonne auf der Terrasse. Die Fränkische Schweiz ist wirklich eine Reise wert. Die Wohnung ist gut gelegen nette Vermieter wir haben uns sehr wohl gefühlt mit Kinder und Hund optimal, war ein Toller Urlaub. Sehr sauberes Apartment mit allem was dazu gehört. Die Gastgeber sind sehr freundlich. Der Parkplatz und eine kleine Terrasse direkt vor dem Apartment. Kann ich nur empfehlen. and cycling trails, the inline options, the caves, the canoeing, climbing forest, swimming, climbing on rocks, riding and visiting castles and and and .... There are many possibilities to relax and enjoy nature. The surrounding areas of Bayreuth, Bamberg, Erlangen and Nuremberg invite to a city stroll.